St Moritz in the Swiss canton of Graubünden is a paradise in the centre of the majestic Alps. Where the jetset go to play, it’s so much more than just an everyday holiday resort. In this article, we will help you find the very best St Moritz accommodation this beautiful town has to offer. St Moritz is stunning whether you visit during winter or in summer. In winter the fantastic slopes of the Engadin Valley and cosy fondue evenings in rustic chalets awaits you. Summer offers some of the best Alpine hiking, beautiful lake views and even surfing lessons. Even in spring and autumn, you’ll never get bored. Indeed, St. Moritz offers you great things to do all year round and is definitely one of the most attractive destinations in Switzerland. The fact that it’s so beloved of the jetset also makes it also one of the more expensive and luxurious places to stay in Switzerland. Because it’s such a desired destination, we also recommend booking as early as possible to get the best St Moritz hotel deals! St Moritz offers some of the best hotels in the world so it’s little wonder there are so many celebrities around. You can be sure that if you book a room in one of the best hotels in St Moritz, you’ll feel like a celebrity yourself, with the added bonus that you’re in one of the most beautiful mountain regions on the planet. Have a look at St Moritz best hotels. This 5 star hotel in St. Moritz is as old as winter tourism in Switzerland itself. Every room faces the beautiful mountains. Five restaurants pamper your culinary needs with local specialities and international haute cuisine. The spa stretches out over two thousand square meters and is equipped with an open-air pool and Kneipp foot bath among other amenities. The Kulm St Moritz even has its own 9-hole golf course, three tennis courts, private ice skating rink and a curling rink. All of this makes it one of the best St Moritz 5-star hotels. Oh, and also the fact that it won the Gault Millau Award Best Hotel. Five-star accommodation with legendary Ritz-Carlton service. St Moritz Carlton offers a 3-floor spa area, 24-hour Bentley limousine service within St. Moritz, butler service and stunning vistas of the Alps and the lake. The hotel restaurant has a Michelin Star and an incredible 18 Gault Millau Points. All the rates include a CHF 100 food and beverage credit per adult per day to be redeemed in all onsite food and beverage outlets of the hotel. This accommodation is a strong contender for the best St Moritz luxury hotels. This 5-star hotel in the centre of St. Moritz is probably one of the visually most beautiful hotels. It sports six restaurants, an indoor pool, a spa and fitness area, a tennis court, stunning lake and mountain views, valet parking and free shuttles to the Corvatch Cable Car. Pick-up and drop-off at the railway station are included as well. Each room comes with a free minibar, a flat-screen satellite TV and a bathroom. The Badrutt’s Palace scores an outstanding 9.6 points on booking.com and belongs to the best hotels in the world. The Badtrutt’s Palace is also one of the best hotels near St Moritz train station. Mid-range St Moritz Switzerland accommodation still comes at a very high standard. Accommodation in St. Moritz for a decent price is becoming more widely available, meaning staying in this stunning mountain village becomes more affordable. If you’re looking for comfort and class, but don’t have the bank balance of a multi-millionaire, then you should definitely have a look at these St Moritz Switzerland hotels. This 4-star hotel in St Moritz is situated right in the city centre and offers high quality. It’s only a 3-minute walk away from the Chantarella funicular. The rooms offer a panoramic view of the lake and the Alps and get especially great reviews for the comfy beds. The rooftop of the Schweizerhof is equipped with a sauna and a steam bath. Fitness facilities are available for free at a partner property. There are also meeting rooms available. In winter there is a kindergarten on site. A great 3-star hotel located close to the Lake St Moritz. The whole hotel is non-smoking. It offers magnificent views of the lake and Piz Nair mountain. The Hotel Sonne is also located very close to a miniature golf course, an artificial ice rink, a cable car, a riding stable, and a health spa. There is a bus to the railway station which stops directly at the hotel. The city centre is 1 km away and is easily reached by foot. The main building is equipped with a restaurant. Centrally located 4-star hotel with indoor pool and spa area, only 300m from the funicular to the Corviglia ski area. Perfect for people who like to eat and party. Three restaurants, three bars and a nightclub on site. There are a Chinese restaurant, a barbecue restaurant and a restaurant with typical Swiss and Italian food, which also happens to be the oldest restaurant in St. Moritz. A hair and beauty salon is also available in the hotel. The reception offers discounted ski passes in winter. We believe that the Steffani is one of the best hotels in St Moritz Switzerland. Mid-range St Moritz hotel fantastically located at the lake. Offers breathtaking panoramic vistas over the Alps and the lake. Great offers for single rooms. The hotel sports a sauna, steam bath, solarium and also offers relaxing massages. Great restaurant on site which serves specialities like fondue, barbecue and fish dishes. Especially notable because it is home to the largest whiskey bar in the world with over 2500 different kinds of whiskey. If you love whiskey and wonder where to stay in St Moritz, then the Hotel Waldhaus am See is your best pick. Finding cheap accommodation in St. Moritz can be rather difficult. 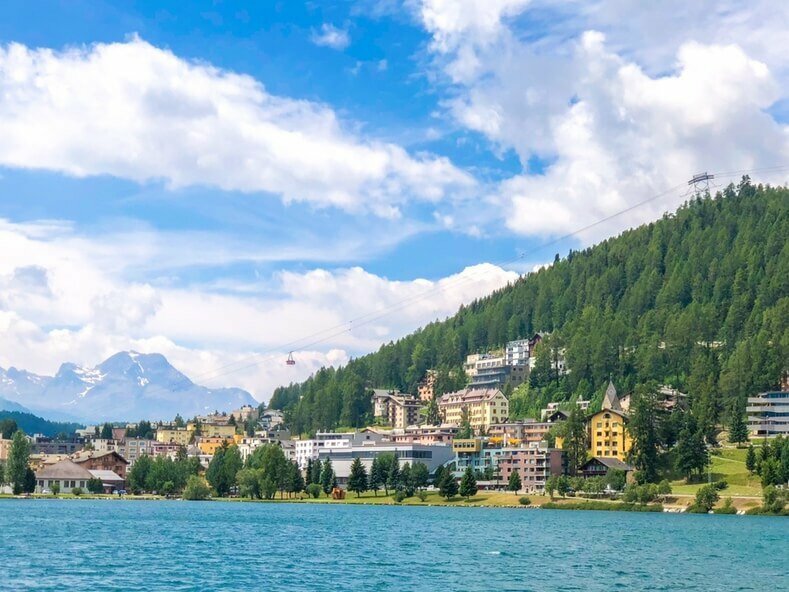 Because the town was originally designed as a resort for the rich and famous, it is a lot easier to find high-quality hotels and luxurious stays than cheap hotels in St Moritz Switzerland. But, you don’t have to be a millionaire to be able to stay in St. Moritz. Here are your options for reasonably budget accommodation in St. Moritz. Probably the most affordable budget accommodation St.Moritz has to offer. It’s situated at the edge of the forest with hiking, cross-country skiing and cycling routes are only 60 m away. The hostel provides free public WiFi, a games room with billiards and table tennis and a common lounge area with an open fireplace. Restaurant with reasonable prices on site. Bus connection to St. Moritz village available. Discounted ski pass for guests who stay longer than one night. A little outside of St. Moritz village but close to the cable car. Budget accommodation offering single, twin and triple rooms. Common area, laundry room and free WiFi available. Each room is equipped with a flatscreen TV and private bathroom. Breakfast in price included. Summer rates include the use of various funiculars, cable cars, and chair lifts. Winter rates include discounts on ski passes. Great accommodation which offers St Moritz apartments and studios. All units are equipped with a fully-equipped kitchenette, a dishwasher, a living room with flat-screen TV, free WiFi and a balcony or terrace. Several restaurants, a local bus station, athletic fields, and Lake St. Moritz only a 5-minute walk away. Buffet breakfast in a partner hotel which is two minutes away. Equipped with a ski storage room and ski passes are available on site. From 1 May until 20 October, tickets to public transportation and cable cars are included in the room rate. Discount on winter ski passes for a stay of more than 2 nights. If you’d love to see this famous town in the Swiss Alps, but don’t necessarily want to stay in the millionaire’s playground, then there are some great alternatives around the area. The whole Engadin Valley offers a broad spectrum of various accommodations, so we’re sure you’ll find the right pick. Also, getting from one town to the other is quite easy. There is a good public transport system and in winter there are even additional ski buses which connect all the beautiful mountain towns and ski resorts. Here are our recommendations for some top hotels near St Moritz. Located only a 5-minute drive away from St. Moritz, this great accommodation offers an inexpensive alternative to the world famous St. Moritz. Studios with a well-equipped kitchen and spacious dining area available. Only 450 m away from the Celerina Staz Railway Station. Celerina Gondola Lifts are less than 5 minutes’ drive away. A stay in summer includes an All in One card, which grants free use of all public buses, cable cars and the Rhaethian Railways. In winter discounted ski passes are available. Away from all the hustle and bustle of St. Moritz, this 4-star hotel offers s high-quality accommodation. It’s only a 10-minute drive to St. Moritz. Two on-site restaurants: The Thai Restaurant Thailando (13 Gault Millau Points ) and the Spunta Engiadina Restaurant, which serves natural gourmet cuisine with a local touch. Rooms are equipped with flat-screen satellite TV, Minibar and en-suite bathrooms. Bar with smoking lounge available. Great views over two lakes and the majestic Swiss Alps. Ideal 3-star hotel for exploring the Valley of Roseg, the Engadin Valley, St. Moritz and various Ski regions. Offers great wellness facilities (including a sauna, hot tub and relaxing indoor and outdoor rest areas), beautiful rooms and finest cuisine. You can have your breakfast in the hotel or in the hotel’s unique Alp Languard mountain cabin, which is situated right at the upper end of the chairlift. St. Moritz is easily reachable by bus. It’s the perfect accommodation for every sports enthusiast. As a kid I spend many winter holidays in the Engadin, some in St. Moritz, some in the surrounding areas. It was always a highlight of my year and I loved every second of it. While it might not be the cheapest place to stay, St. Moritz is definitely worth every cent. It’s the perfect location for winter activities in Switzerland and there are so many things to do and see in the village and the neighbourhood. If you decide to book some winter holidays in St. Moritz or any other mountain resort like for example Zermatt, then make sure to check our ultimate packing list, so you won’t forget anything at home. Also, if you’re interested in other Swiss winter destinations, check out this post about the 10 best Swiss ski holiday resorts. And in case you’re looking for a really special experience check out our post about the unparalleled Glacier Express experience we had.